This month Gala says thank you, Intersport offers 20% off to parkrunners, we ask you to complete a short survey, there’s information on receiving your results each week by text, you can join the parkrun team in the Dublin Race Series, and I look ahead to a great summer of athletics. The attendance at parkrun since the new year has been fantastic, with an amazing 50% increase on last year’s attendance figures. All these new people participating at parkrun is at the heart of what we are trying to achieve, but the stats alone are not the full story. The average parkrunner participates at parkrun around six times, with many progressively branching out into clubs and other events. Coming up we have the mini-marathon with parkrun being recognised as an entry standard, and over the next few months we will see the build up to the Dublin Marathon in October. I read so many stories of people running their first half marathons and marathons having started their journey at parkrun, and this pathway is what we are proud to be part of. It’s going to be a great summer for athletics, with the European Championships in July and the Olympics in August, so we can all look forward to being out there participating at whatever level we are at, and just being part of this great sport. So enjoy your summer and remember to come back to parkrun and visit your roots! Last year, Gala launched its ‘Your Choice with Gala’ health and wellness strategy that was designed to promote healthier choices and lifestyles in Gala stores’ local communities. An integral part of this strategy has been Gala’s partnership with parkrun. As parkrun Ireland’s first commercial partner, Gala immediately recognised the beauty of the parkrun ethos, and its significant growth across Ireland is a testament to this. With many parkruns taking place in our retailers’ communities and Gala known as being one of Ireland’s community convenience retailers, it’s this ‘fit’ with parkrun that makes Gala the ideal nationwide partner. Since the start of the year, you may have noticed Gala branding popping up at your events. 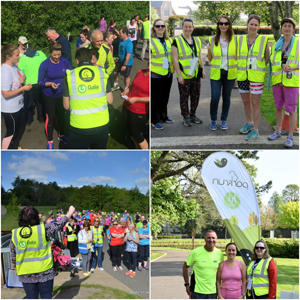 We are proud that parkrun Ireland’s hundreds of volunteers don our Gala-branded high-vis vests every week, and we’re thrilled to be supporting the thousands of senior and junior parkrunners that enjoy their weekly parkruns across Ireland. We’d like to say a big thanks to YOU for participating and well done to parkrun Ireland and to all of the volunteers who make the weekly events such a success. Here’s to many more parkruns! We are really enjoying being your partners and want to celebrate with you by offering parkrunners 20% off your running gear at Intersport. If you’ve had your eye on a new piece of kit then now is the time to buy it! Simply head to your local Intersport store during June and show your parkrun barcode to claim your exclusive parkrun partnership price (PPP)*. 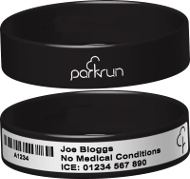 After June, parkrunners will then continue to be able to claim 10% off your running gear as an ongoing community offer #PPP. Whatever you need to support your running, do come and chat to us – we love to hear what you’re up to and we’ve got plenty of advice for all levels of runner. Pop into your local store (find your nearest store at www.intersport.co.uk) and don’t forget your barcode! Remember to keep the pictures coming on Twitter #loveparkrun and make sure you like us on Facebook to keep up with what’s going on. *PPP valid at all participating Intersport stores, see our website for details. Do you or a close relative have a disability? If so, we would like to ask you to complete a short survey to enable us to better understand who is participating at parkruns in Ireland and how can we encourage everone to take part. Do you get your parkrun results by text? If not, would you like to? Thanks to our supporters at Phillip Lee, you can activate this free service that sends your result straight to your phone each week! Looking for a challenge? Why not try out some new distances, and maybe build towards your first marathon. SSE Airtricity Dublin Race Series is a four race series running throughout the summer, that will see participants gradually increasing their mileage towards the 26.2 mark. The first run will start with the Irish Runner 5 Mile and progress up to half marathon distance in preparation for the Marathon on Sunday 30 October. When entering, choose ‘parkrun’ as your team so we can track your progress. I completed my 100th parkrun last month at Naas parkrun. I want to say a big thanks to all involved at parkrun Ireland, and especially to everyone involved at Naas parkrun. In my wildest dreams I never thought I would run 100 parkruns. The volunteers at Naas are a fantastic bunch of people, they are there every week through thick and thin, always encouraging everyone to enjoy themselves. I cannot thank these people enough for what they do. Once again a big thank you to one and all. Looking forward to the next 100 runs! I want to thank you all very much for the parkrun last Saturday in Dublin. I am from Sweden and it was my first parkrun ever, and you all did a fantastic job. I was running together with my friends John and Carol Watters, and I will try to do it again next time I come over to your lovely country and city. Best wishes to all of you from Sweden! Favourite volunteer role: I enjoy barcode scanning, as you get to see all of the runners come in and it's (relatively) stress free! What do you do at parkruns: I usually get to the park at around 9:20am. I run around for a bit and pretend that I know how to warm up properly! I listen to the briefing and then I get ready for the two laps of pain! How has parkrun changed your running: I never ran before I started parkrun. In Transition Year one of my teachers suggested that I do parkrun for the physical challenge part of my Gaisce award. I managed to do the 26 weeks required and I have kept it up since. I now run a few times a week and have even done a few 10ks. What do you like about parkrun: I love the community that exists around the whole event. It's also great to see your progress each week and to compare yourself against other regulars. But the best part is that it's all free! Most memorable or funniest parkrun moment: I busted my gut one Saturday morning and came in just ahead of a certain female parkrunner who had finished ahead of me every previous week. I thought I was great, until seconds after crossing the line I heard her say that she 'found that one tough' because she was five months pregnant. That put me back in my box!